The first step of parboiling the wings in very salty water helps to make the cooked wings really moist and tender. Don’t skip this step. Let the wings dry thoroughly after parboiling. This may take about 10 minutes or they can be dried with paper towel if you’re in a big hurry. 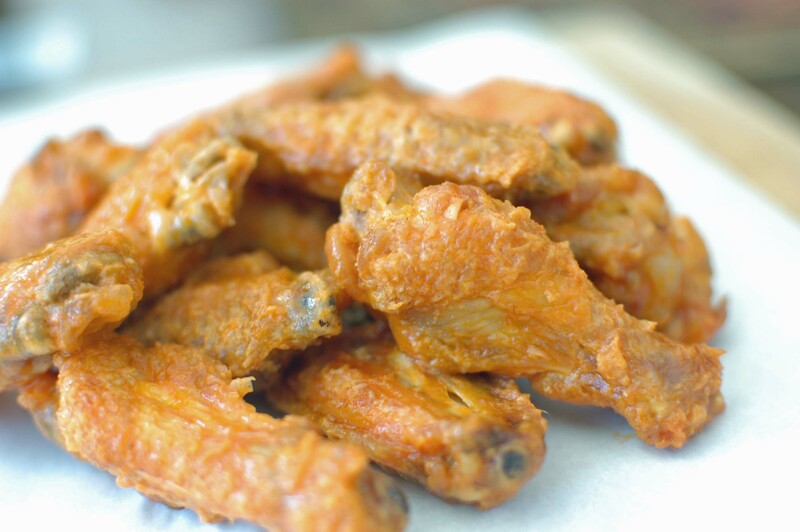 Judging the cooking time can be a bit hard even for the experienced cook.All wings are not createed equal in size. All but once I have used large wings from Patak’s. 2 pounds = about 12 pieces. Parboil time was 10 minutes and total baking time 30 -35 minutes. Today I used much smaller wings. 2 pounds = 16 pieces. Parboil times was 7 minutes and total baking time 25 minutes. Adjust cooking times according to size for the results to be crispy on the outside and juicy on the inside. Don’t line your baking sheet with aluminum foil. 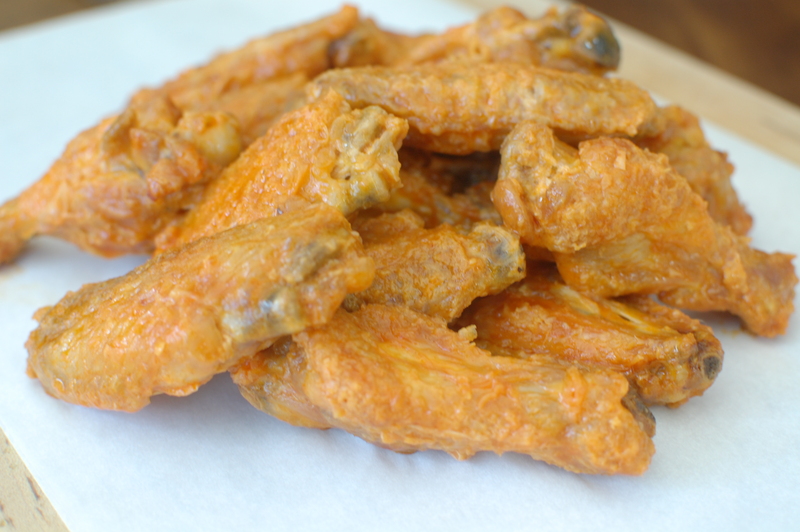 The wings will stick and lose the crispy skin. I know this from experience! I like using parchment paper to line the baking sheet. 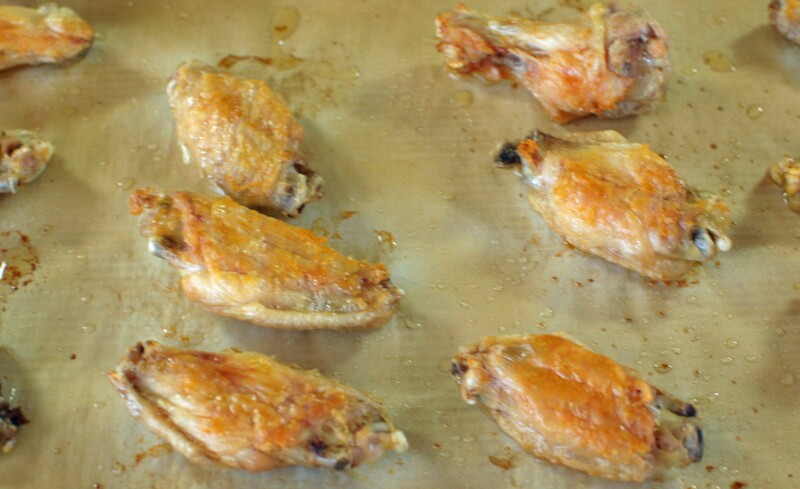 If you don’t line the sheet just put the wings directly on the baking sheet. I love the original hot wing sauce, but feel free to use your own. This week I have seen this same recipe floating around with a variety of sauces. Just bake these and you’ll be hooked. I am because they’ve been on my menu at least once a month for the last year! Bring a large pot of water to a boil. Add 1 Tablespoon salt. Boil chicken wings for 7 minutes. Place on cooling racks with paper towel under to catch drips. Let them dry for about 10 minutes. If you are in a big hurry, dry them with paper towel. Place them on a baking sheet. I like to line mine with parchment paper. Bake for about 20 -35 minutes. Depends on size. Turn over and bake for about 5 minutes . In a bowl add melted butter, hot sauce and Tobasco. Add wings and toss. I want to try to make these, I’ve made them before but they came out mushy. Oh, by the way, here in Sicily I cannot get ready made sauce…what spices should I use? I’m not quite sure. Did you try to order online? Check out google. Sorry that I have no recipe.